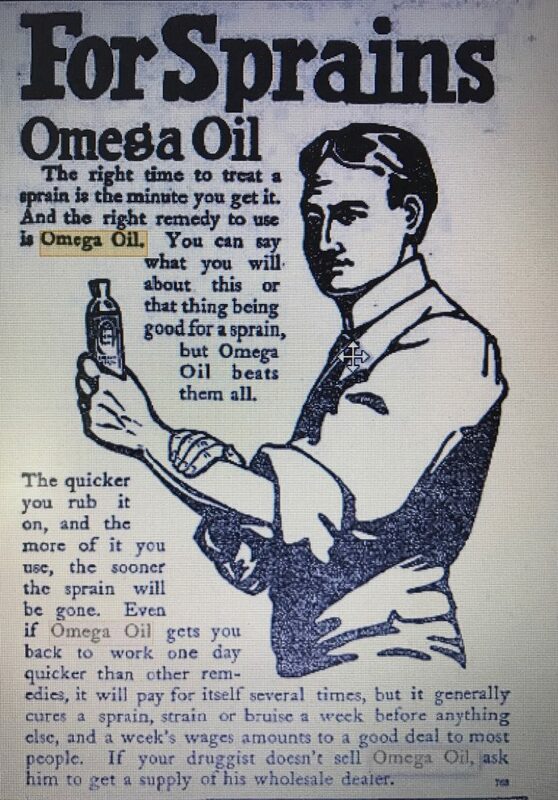 Omega Oil first entered the market in late 1898 or early 1899. Their first newspaper advertisements which began appearing in 1899, were presented to look more like news items and told a version of the product’s origin that they’d have you believe. This advertisement from the January 6, 1901 edition of the Brooklyn Daily Eagle was typical of these early advertisements. 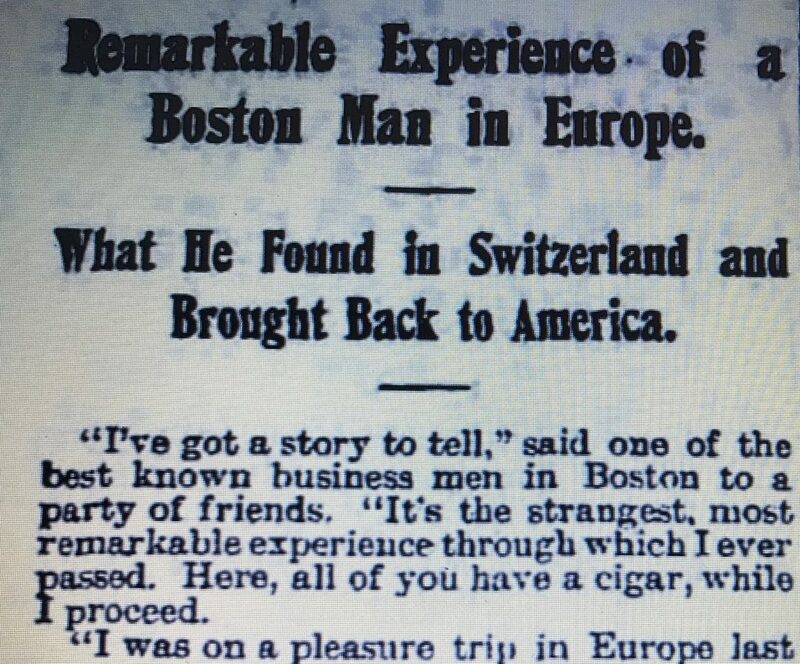 As the story goes, a Boston businessman was in Europe on vacation. While there, his wife fell from a carriage and broke her ankle. No doctor or remedy could cure her until, while in Switzerland, he met a young woman whose grandfather made a “queer green oil” that cured her within two hours. The “almost miraculous curative virtues” of the oil, and the reason for it’s green color came from a rare herb that grew only in a certain part of Switzerland. The man ultimately bought the recipe, returned to the United States, invested in the oil and organized a company to manufacture it. The company, called the Omega Chemical Company, was originally located at 29 Central Street in Boston, Mass. Advertisements in 1899 and early 1900 referenced this address. Sometime in the Spring of 1900, the Boston address vanished from the advertisements and the company apparently moved its operation to New York City. By the end of 1900, company advertisements referenced their address as 257 Broadway in New York City. The first New York City listing I can find for the Omega Chemical Company is in the 1900 Trow Copartnership and Corporation Directory. A New York corporation with capital of $100,000 their address was listed as 41 Park Row. Michael Wineburgh (spelled Winburn in later years) and Bert M Moses were named as president and secretary respectively. A year later, in 1901, the business was listed at the 257 Broadway address. In 1904 their address was listed as 452 Fifth Avenue and by 1908 it was 576 Fifth Avenue. In 1919 Winburn (no longer spelled Wineburgh)was still listed as president, with Clara Jerolemon and S.E. Sierack listed as treasurer and secretary, respectively. The business was still listed at 576 Fifth Avenue in the 1933 Manhattan telephone directory. Beginning around 1904, they also maintained a factory at 243 Greenwich Street. The factory moved to Brooklyn around 1914 where it was listed in the telephone directories through the mid 1930’s (34th Street and later 36th Street). Winburn passed away in November, 1930 and in May,1931 his estate sold the business to Colgate-Palmolive-Peet. The sale was reported in the May 15th editions of newspapers across the country. This Chicago Tribune story was typical. The Colgate-Palmolive-Peet Company yesterday announced the acquisition of the Omega Chemical Company of New York for approximately $3,000,000. Purchase was made from the estate of Michael Winburn. The Omega Chemical Company owns a controlling interest in Omega, Ltd., of London and in the Societe Cadum of France and Societe Cadum Belge of Brussels. Societe Cadum of Paris is one of the largest soap manufacturers in France. It appears that the company left New York City sometime in the late 1930’s. 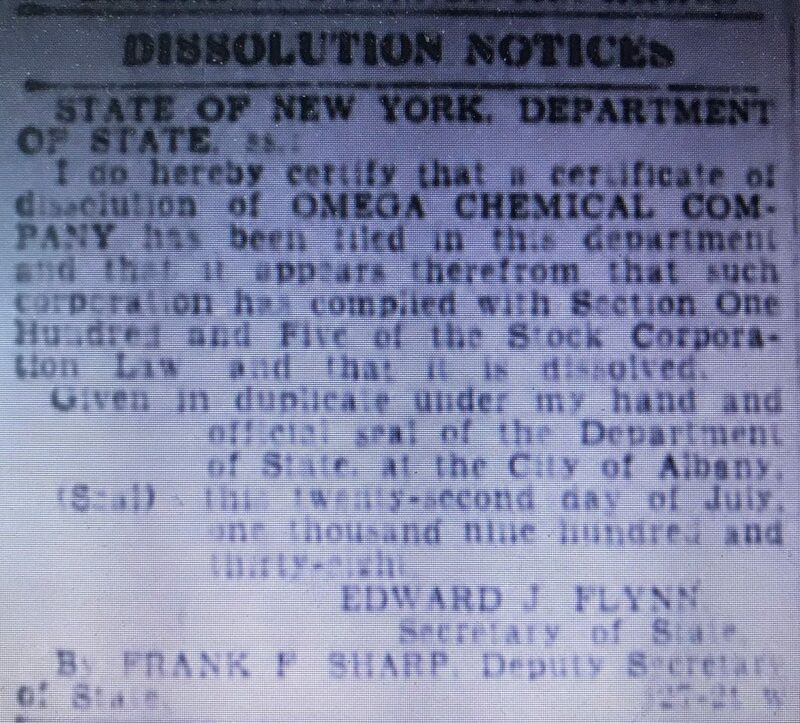 The 1937 Brooklyn telephone directory indicated that the Omega Chemical Company factory had moved to Jersey City and according to a notice in the August 3, 1938 edition of the Brooklyn Daily Eagle, the New York Corporation was dissolved in July of that year. The business appears to have remained active in New Jersey well into the 1950’s. Omega Oil is a Summer as well as a Winter liniment. It is a godsend to old people whose joints get stiff as the years pile up. It takes out soreness caused by hard work or hard exercise or hard pleasure. It builds up the muscular tissues from the outside. There is no sense in swallowing nasty drugs and ruining your stomach to give you strength in your body. Rub in Omega Oil if you want to build up your muscles. 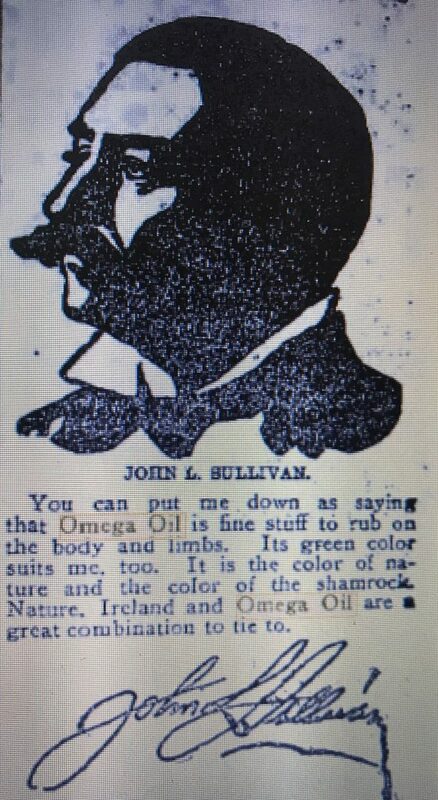 Omega Oil cures Weak Backs. Lame Shoulders, Tired Arms and Legs. Stiff Elbows, Wrists, Fingers, Knees, Ankles and Joints. Rheumatism, Lumbago, Neuralgia, Sore Throat, Cold in the Chest, Sore Muscles. Aching, Itching, Sore, Swollen, Tired, Sweaty Feet. A godsend to old people. Freshens, invigorates and strengthens the muscular tissues after hard exercise, hard work or hard pleasure. Good for everything a hard liniment ought to be good for. Another 1901 advertisement, this one marketed it as a cure for sprains, exhibited the same type of bottle as the one I found. No salesman of any kind whatever was employed. There was not a bottle of Omega Oil in the drug stores when the advertising began. Its promoters began paying out hundreds of dollars a day to advertise in the newspapers, street cars and on sign boards, and distributed millions of books. The demand began instantly…This great demand has been created by two things, and only two – an unusually good article and unusually good advertising. It will penetrate to your very bones, and soothe, soften and subdue the hurting. There is nothing in it except what grows out of the ground. It has the beautiful color of Nature – it is a sparkling emerald green. Rub it in freely. It will not blister or burn the skin. Rub it in and the hurting will stop. 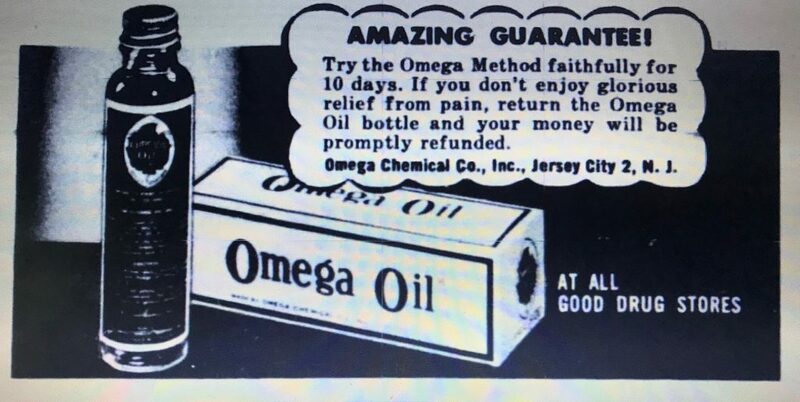 Employing another one of today’s marketing strategies, Omega Oil was one of the first products I’ve found that used professional athletes as spokesmen. One of their newspaper advertisements printed endorsements from famous prize fighters of the time. Famous Fighters. Real Secret of Their Endurance and Strength. Jeffries, Ruhlin, Corbett, Fitzsimmons, Sullivan, Kid McCoy, Peter Maher, McGovern and Others Indorse the Same Method. The successful athlete doesn’t take chances with his physical condition. His success depends upon his muscles, and he is mighty careful to keep them in good shape. He uses the very best things that he can find. This time honored medication is fortified for swift relief by two wonderful ingredients: one of the most powerful external pain killers known to modern science, plus a really remarkable deep-acting, heat-inducing ingredient. The Federal Trade Commission has been listening to commercials on radio and television and today it announced its first complaints. The agency said complaints of false advertising have been issued against three distributors of arthritis and rheumatism medicines. It’s not clear when the product was discontinued but I’ve seen it listed in drug store advertisements as late as 1979. The company’s original NYC location, 41 Park Row, is also called the NY Times Building. Around the turn of the century, the building was rebuilt around it’s original core probably necessitating the move to Broadway. 576 Fifth Avenue was built in 1907 so the business was probably an original tenant there. It looks like 257 Broadway and 457 Fifth Avenue also date back to the business. The bottle I found is a machine made vile similar to the one in the above advertisement. Assuming that the new factory location in Brooklyn was fitted with up-to-date equipment, including automated bottle machines, it was probably manufactured after the move there in 1914. 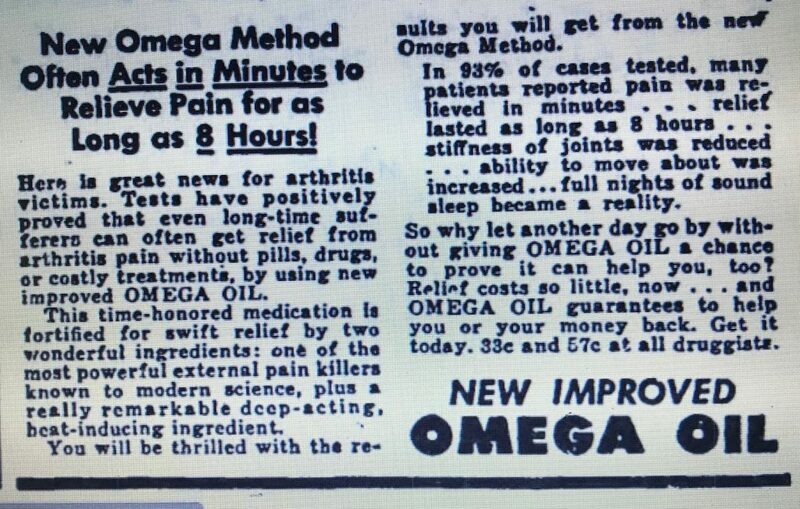 Up through the 1950’s the packaging of Omega Oil changed very little. This 1955 advertisement exhibits pretty much the same vial as the one pictured in advertisements from the early 1900’s, except that a screw top has replaced the cork top.